The margin property adds spacing between the elements while CSS padding between the content and container boundary. 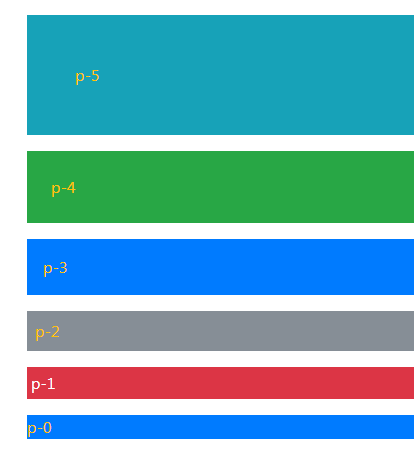 The Bootstrap 4 has built-in utility responsive classes for margin and padding that you may use easily in various elements to manage the spacing. The size can be from value 0 to 5 and auto. I will show you examples for seeing the difference. The breakpoint = sm, md, lg, and xl. Now, let me show you the usage of these padding and margin shorthand utility classes in action in Bootstrap 4. You can see, the p-0 is adjacent to the container div element and the difference of padding in all directions for different utility classes. In the following example, four paragraphs are given different individual padding classes. The first applies from the small devices by using pl-sm-5 class. That is, only the left padding will apply. In the second <p> tag, the pt-md-2 and pl-md-3 classes are used. That means from medium viewports, the top padding will be two points and left padding is 3. For the third paragraph, pt-lg-3 and pl-lg-2 class are applied. By .lg, it means from large devices/viewports. The left padding is 2 and top padding is 3. Finally, the last paragraph is given the padding classes for extra large viewports. The classes are pt-xl-5 and pl-xl-4. 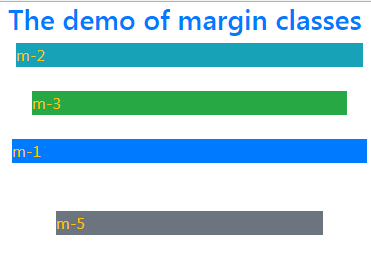 In the same way, you may use the Bootstrap margin utility classes for adding the space between elements. Just like padding, you may use a single class for all directions or individual classes for each direction. Grab the complete code from the example page.